Promise City may have the most optimistic name in all of Southern Iowa. I had looked in every restaurant in the nearby metropolis of Corydon, but found no notable tenderloins. A trip to Seymour meant I had to drive past this cafe twice. The owner's of the No Name Cafe refurbished a vacant building and now operate the only restaurant for several miles around. Sure, they had a hand-breaded tenderloin. But further down the menu was a colossal pork sandwich that I could not refuse. 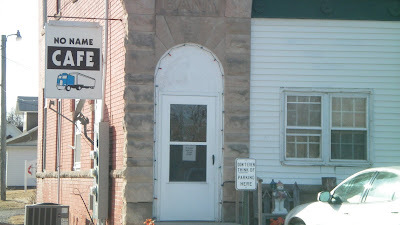 Location: 101 N Center St in Promise City (population 105) in Wayne County, Iowa. Located between Corydon and Centerville. Directions: Take Highway 2 East from I-35, past Leon and Corydon. The cafe on the main street, the only busy street in town, facing the parking lot the the community center. The Tyson Whole Hog Tenderloin: I ordered this and sat down for a while as it cooked. Soon I heard the younger waitress asking the other what to do with a sandwich that wouldn't fit in the to-go container. I took it without closing the lid over, because I had what I wanted. This was a big sandwich packed with pork. 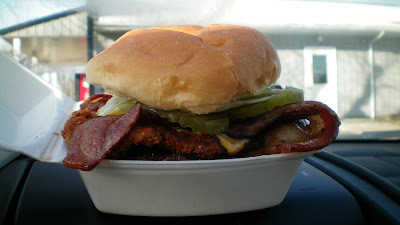 The tenderloin was hand-breaded, tenderized at the local meat locker. It was much thicker in the center with good chewy consistency. the ham was thick and moist, the bacon was fatty and good. The two slices of cheese tasted like Kraft singles, but were melted just right to make the meats stick together. All served on a bun that was cold, but the bun was just an edible napkin here. Price: $6.50, regular tenderloin $4.50, "Cajun Tenderloin" also available for $4.75. Also on the menu: Full breakfast, with burgers and sandwiches. Today's special was sweet-potato fries. Service: Seat yourself wherever you want, I think this was a husband and wife operation, with a twenty-something daughter who helped with working the tables. Ambiance: The Cafe itself was about as humble as its name implied.There were tables, booths, and a counter for seating. The high ceilings of the old building were nice, good natural light come through the windows. Final Thoughts: This is a dangerous sandwich. I eventually recovered from eating this gigantic hunk of hot pork. These sorts of things are just goofy additions to the menu for people who can't get enough. I do not recommend eating a sandwich like this while driving. 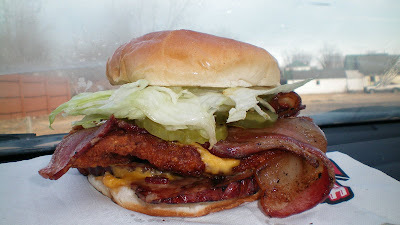 Its best enjoyed in an environment where a heart attack can be treated promptly. OMG... I just stumbled across your blog and my husband is going nuts. We are going look right now to see how far we are away from the No Name Cafe! Good Job love the blog. 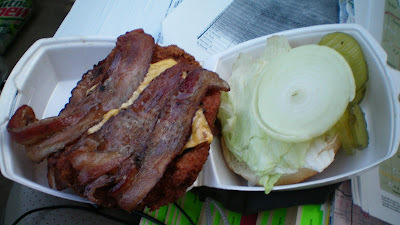 OMG that tenderloin looks soo good. 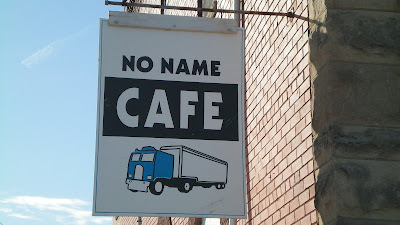 We will have to plan a roadtrip to the No Name Cafe. I just stumbled across your blog and my husband and I love it.